Oh yes!!!!!!! If you're anything like me, you're always looking for a way to earn health and beauty items with those coupons from the Sunday paper. One of the hottest coupons in the June 29th Smart Source Coupon insert will score you Bic Disposable Razors for ONLY $.96 a pack! What a DEAL! So, grab the June 29th Smart Source and SCORE. 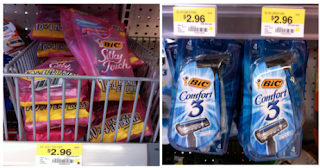 Find the $2 off Bic Disposable Razors coupon and stock up at your local Walmart.